To no one’s surprise, the story of CES 2019 was the battle between Amazon and Google to lead the emerging voice-first world. In the aftermath of CES, though, one question looms: What exactly do Amazon and Google get out of winning this battle? Both Amazon and Google used CES to state the case for their leadership of voice (Apple, Microsoft, and Samsung, while certainly players, are not the leaders in voice although Apple is a strong challenger). Google announced that Google Assistant is on one billion devices, up from 500 million in May 2018 (a figure boosted by the sale of Android phones that contain Google Assistant by default). Amazon disclosed that it has sold more than 100 million devices that rely on its Alexa virtual assistant. In addition, the number of people who use Alexa every day — and who own more than one Amazon Echo smart speaker — doubled in 2018. Meanwhile, during CES, more telling numbers were disclosed. According to research conducted by Edison Research and NPR, 53 million adults in the United States (or two out of 10 Americans) own at least one voice-activated smart speaker. The number of smart speakers in homes has increased 78 percent year over year. And on January 8, Accenture reported that half of online consumers globally use digital voice assistants, up from 42 percent one year ago. These figures don’t mean that people are actually using their voices to buy things from businesses. In fact, most people use voice assistants to perform everyday tasks such as listening to music and getting weather information. But the usage data is important nevertheless. It shows that even if we’re not exactly living in a voice-first world, we’re getting there – and doing so quickly considering that the Amazon Echo didn’t exist until 2014, and Google Home just two years later. In addition, by 2016, 20 percent of all Google mobile queries were voice searches. The rise of voice also helps explains why so many companies continue to launch products fueled by voice at CES, and 2019 was no exception. Lenovo announced an alarm clock powered by Google Assistant. KitchenAid and GE rolled out smart displays that rely on Google Assistant to help you get recipes, watch videos, and do anything else to keep you occupied and entertained in the kitchen. Currant’s new smart wall outlet, which can be controlled by Alexa and Google Assistant, monitors energy usage and suggests which products to automatically turn off to conserve power. The Dalkin smart thermostat works with Alexa and Google Assistant to control the climate in your home. You can learn more about major product announcements here and here. (For those of you keeping score, in November 2018, Recode reported that Google Assistant works with 10,000 smart home devices versus 20,000 for Alexa.) But the most intriguing products, such as the Currant smart wall outlet, use artificial intelligence to not only act on your voice commands but also give you information and manage your home without your intervention. Amazon announced a stronger push into voice-powered automobiles. CES was barely under way when Amazon and Telenav, a provider of connected car and location-based services, announced a relationship that makes it possible for drivers to use the Telenav Alexa-powered navigation system to do the same kinds of functional tasks that they can do with Google Maps. And then Amazon formally launched Amazon Echo smart speaker for the car. Google announced a similar product through a relationship with Anker’s Roav automotive accessory, which is essentially a Google Home for the car. These announcements continued a battle for on-the-go voice experiences that has been going on for some with Google, Apple, and Amazon all rapidly launching products and software designed to be the de facto infotainment systems for different car manufacturers. The irony is that major auto makers have been announcing dips in sales for 2018. But overall, automotive has been a strong industry over the past several years. And now cars are getting smarter. The company that owns the ecosystem monetizes the voice-first world. For Google, being the backbone of voice protects the company’s online advertising business, which accounts for more than 70 percent of Google’s revenue. Google needs to keep giving people reasons to keep using products such as the Google search engine, Google Maps, and the Google Chrome web browser. As people stay on Google, Google can continue to deliver audiences to advertisers and learn from audience behavior. 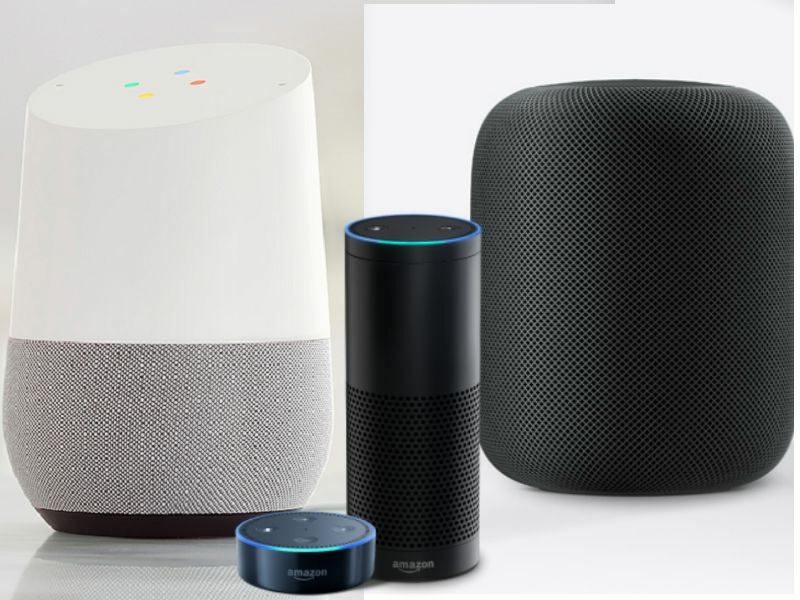 As people use voice, Google can keep them on Google by incorporating voice into its products, launching new products such as Google Home, and making Google Assistant part of other companies’ products, which is the alarm clocks, thermostats, and cars using Google Assistant come into play. But it’s not all about advertising for Google. Google also wants intelligent voice assistants to make Google software and hardware (such as Pixel phones) more useful and popular, a dramatic example being Google’s Duplex software, which can make convincing phone calls on behalf of human beings. Amazon has its own motivations. Amazon is already a popular search engine for product searches, with half of online shoppers starting their searches on Amazon. Amazon also needs to incorporate voice to keep those shoppers using Amazon as they become more comfortable using voice – not just because Amazon wants them to buy things from Amazon with their voices, but also because Amazon is building an online advertising business that is already the third largest in the industry, behind Google and Facebook. As Amazon creates its own advertising business, it, too, needs to show potential advertisers that it can deliver an audience to them – in the home and on the go, whether they use their voices or text to get what they need. In 2018, it was reported that Amazon was in talks with advertising giants such as Procter & Gamble to permit them to advertise on Amazon Echo speakers. Amazon has denied that it’s going to permit advertising through Alexa. But even if Amazon does not offer ads, per se, it can use voice to mine valuable data about its customers that would be useful to its advertisers, such as Google can. Amazon is already working with businesses to monetize skills. Through premium content known as in-skill products that reside within Alexa skills, businesses can sell premium content such as in-game currency. For example, Stoked Skill offers free games such as Escape the Room and Escape the Airplane. The games are set up as Alexa skills. Players use Alexa skills to find clues that will help them escape spaces such as jell cells and cars. Customers can pay for optional “hint” packs (in in-skill product) that make it easier for them to escape. I could see Amazon also offering branded content and products to Prime customers who use Echo, such as discounts at local restaurants unlocked exclusively through Amazon Echo Auto. Doing so would monetize voice without more intrusive advertising that lack any useful offers. Finally, Amazon has other plans to monetize voice in the enterprise, such as Alexa for Business to help enterprises use Alexa to improve workforce productivity. As these examples show, companies are using Alexa for Business to book conference rooms, manage the connection status of shared devices, and other workplace tasks. But Amazon has competition in the enterprise most notably from Apple and Microsoft. Google picks products from merchants thatare most relevant to the query. It also considers purchase history and information about user preferences, as well as an item’s availability and proximity. Today, businesses are participating by creating sometimes clever and inventive voice-based brand building experiences, such as HBO’s voice-activated Westworld game, in which people use Alexa to explore the mythical Westworld. Other businesses have created their own branded Alexa skills. With Tide’s Stain Remover skill, you can get stain removal instructions shared with you through Alexa. Campbell’s offers recipes through Campbell’s Kitchen. Presumably, these businesses could offer in-skill products if they wanted to, an example being HBO offering a premium-tier Westworld game for purchase. And businesses are optimizing their content to be found through voice search. Amazon and Google are not the only companies doing the heavy lifting, but they are leading the way to a voice-first world. Smart companies are going with them. This entry was posted in Amazon, Google and tagged Alexa, Amazon, Amazon Echo, Apple, CES, CES 2019, David Deal, Google, Google Assistant, Google Home, Microsoft, Samsung, Superhype, Voice First. Bookmark the permalink.